A resident recently wrote in The Seattle Times that he's leaving the city after 14 years, citing homelessness, property crime and the high cost of living. Other people are leaving, too. So where are they headed? For years we’ve been talking about the throngs of newcomers flooding into Seattle. But now, it seems, the trending topic of conversation is all the folks who are moving in the opposite direction. Homelessness, property crime and the high cost of living are just some of the complaints reeled off in a Seattle Times op-ed by a 14-year resident who’s saying goodbye and good riddance to the city. The piece spent days as the top story on The Times’ website, eliciting more than 1,500 comments from readers. That comes on the heels of another article about a longtime Seattle resident who realized that, to retire with enough money to get by, she’ll need to relocate to somewhere with a lower cost of living. She’s considering Spokane. A recent report by Redfin, the national real-estate brokerage, found that more of its site’s users were looking to leave Seattle than to move here in the fourth quarter of 2017 — a reversal from previous quarters. If there really is a sudden rash of people leaving this area, it’s too recent to be captured in the data currently available. But we can take a look at where folks who’ve left this area in recent years went. According to census data, about 104,000 people move away from King County each year. That figure is based on the average number of movers from 2011 through 2015. Many of them don’t go all that far. Snohomish County is the top recipient of King County movers, with Pierce County just slightly behind. Together, they take in about 30,000 people, most of whom, surely, are looking for more home for the dollar or cheaper digs. Another 18,000 people trade in King County for some other part of Washington. 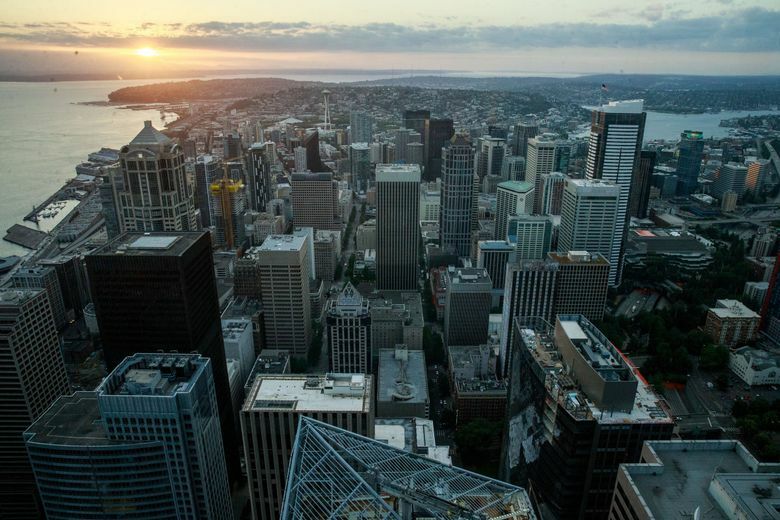 While Seattle is known as a magnet for millennials, they’re also the biggest group to leave. Nearly half (46 percent) of those exiting King County each year are age 18 to 34. A lot of them head to Whatcom County, where Bellingham is located. Whatcom is the state’s top destination outside the Seattle metro area, and nearly 80 percent of the King County folks who move there are millennials. Many, certainly, go there for Western Washington University. But there are also anecdotal reports of an influx of Seattleites into Bellingham, not to attend school but to escape the Puget Sound area’s high housing costs. We may have a long history of kvetching about Californians moving to the Seattle area, but we send our fair share of folks their way, too. The Golden State is far and away the top destination outside of Washington for folks leaving King County, to the tune of about 14,500 people per year. Los Angeles County draws the most, at about 2,800. In fact, it ranks 3rd among U.S. counties, right behind Snohomish and Pierce. This may come as a surprise, considering all the reports of tech workers fleeing Silicon Valley for Seattle: After Los Angeles, the top California recipient from King County is pricey Santa Clara County, where Google, Apple and so many other tech companies are headquartered. And census data show that more people from King move to Santa Clara than the reverse — though perhaps that has changed recently, and just hasn’t shown up in the data yet. (Santa Clara county is not on the map of the top 10 counties for King County movers because it ranks 11th). California absorbs two and a half times more people from here than No. 2 Oregon, where about 5,600 ex-King County residents settle each year. Multnomah County, where Portland is, ranks as the eighth among all U.S. counties. It’s also the top destination outside the Seattle metro area for Gen X-ers leaving King County. Arizona is the No. 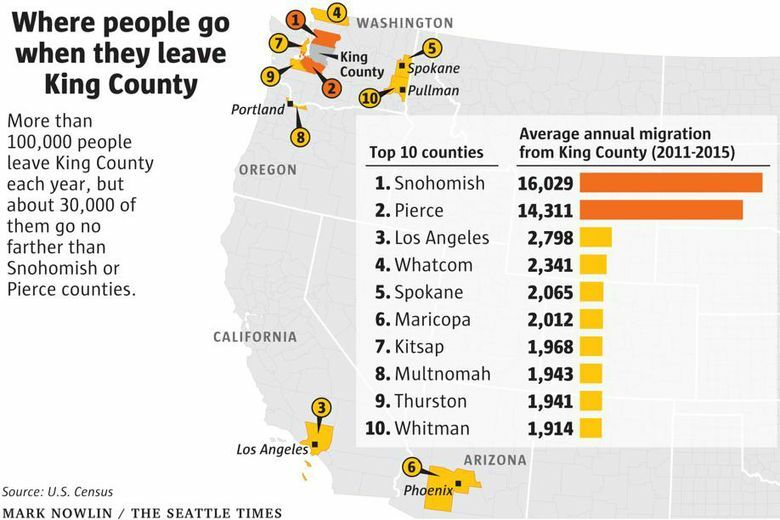 3 out-of-state destination, with about 3,300 movers from King County each year. For older folks — those age 50 and up — Phoenix’s Maricopa County is the biggest draw outside the Seattle area. One thing to keep in mind: More people still move here than move away. Census data show that last year, King County had a net gain of about 2,800 arriving from other counties within the U.S. But in what could turn out to be a sign for the future, that number’s down from 8,500 just one year earlier. Correction: An earlier version of this story included a map that misidentified Maricopa and Multnomah counties.